As hard-to-find nostalgic treats go, I’m not sure the vanilla caramel Drumstick tops many people’s lists. After all, the regular vanilla version is all over the place, there are chocolate ice cream versions, fudge-core options, and even varieties with Nestle Crunch in place of the usual dome of peanuts—enough to make the casual ice cream eater gorge for weeks. But for me, it’s caramel or nothing. I don’t want a Drumstick without that crucial gooey core. And for whatever reason, it’s been an elusive find around New Jersey for the past few years. It doesn’t appear in any of Nestle’s variety packs, so those were useless to me. I’d see a box in one grocery store and gleefully snag it, only to come up short the next time I stopped in. I got Dan in on the hunt: Target became a semi-regular source for my stash, so we took to stalking the frozen treats aisle there and hoarding boxes three at a time when we’d spot the signature orange wave on the package. A few times, we’d half-joke about just throwing up our hands and making them from scratch, but a homemade ice cream Drumstick never made it off the planning boards—even during recipe testing for Classic Snacks Made from Scratch. This now strikes me as a criminal oversight. After all, it’s made of a bunch of ingredients I already make from scratch: ice cream, caramel, and chocolate magic shell. What finally pushed me over the edge and into action was a brainstorm for a simple but irresistible customization: peanut butter caramel, a rich and salty tweak to my favorite basic caramel sauce. The result of the tweaking is a homemade ice cream treat with just enough of an edge, hitting all the nostalgic notes of the original caramel-filled cone, but with a sassy underpinning. 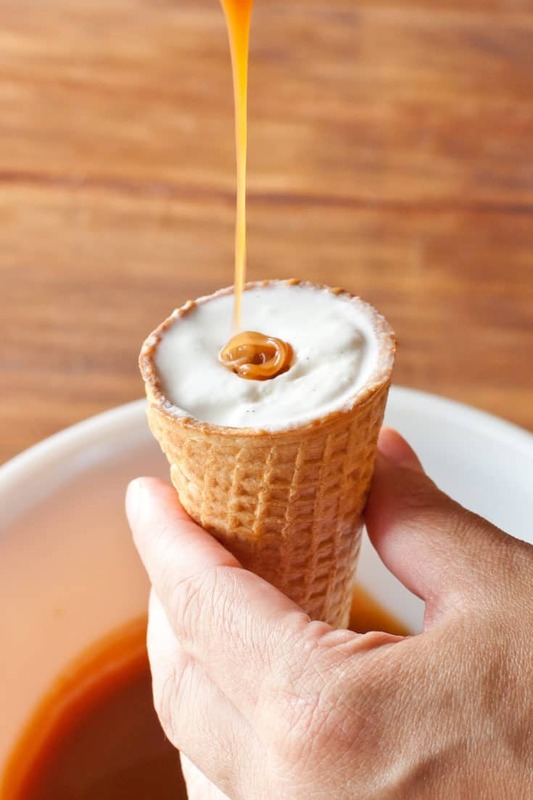 And it’s easier than you think to fill your ice cream cones with caramel. As shown in the photos above, all you need to do is drill a tunnel with a metal straw or large skewer and drizzle the chocolate right in. Dare I make the next round with peanut-studded salted caramel ice cream next time? Dare I add crushed pretzels to the topping? Or is that just gilding the lily? 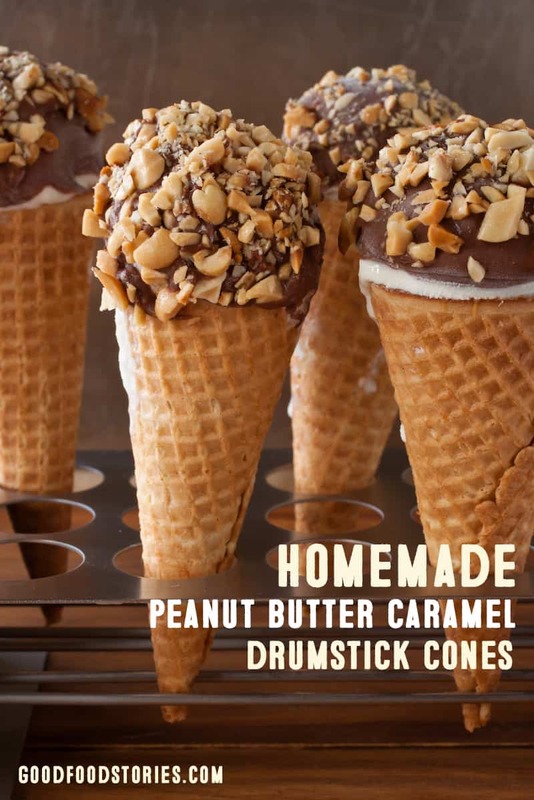 Homemade peanut butter caramel Drumstick cones topped with magic shell take the classic ice cream treat and turn it into something luxurious. Warm the chocolate magic shell in a saucepan over low heat to keep it liquefied. Paint the insides of the sugar cones with a thin layer of magic shell—and while a silicone basting brush works fine, a plain old butter knife is a surprisingly great tool for this! Make sure to let a little magic shell drip into the bottom of the cone to make that last-bite nugget of chocolate. 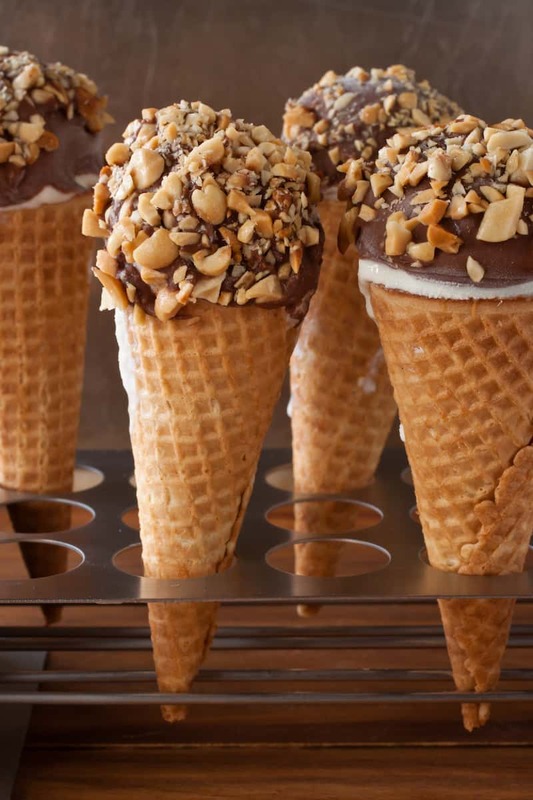 Chill the chocolate-coated cones in the refrigerator for 30 minutes to harden the magic shell. 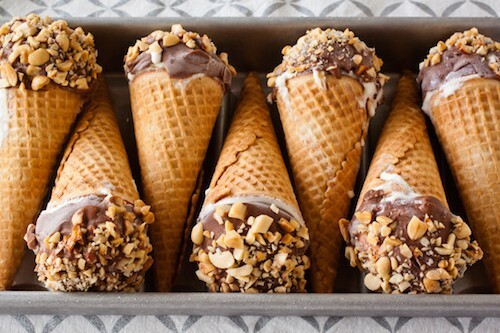 Fill the cones with ice cream, making sure to press the ice cream the whole way down to the bottom of the cone. 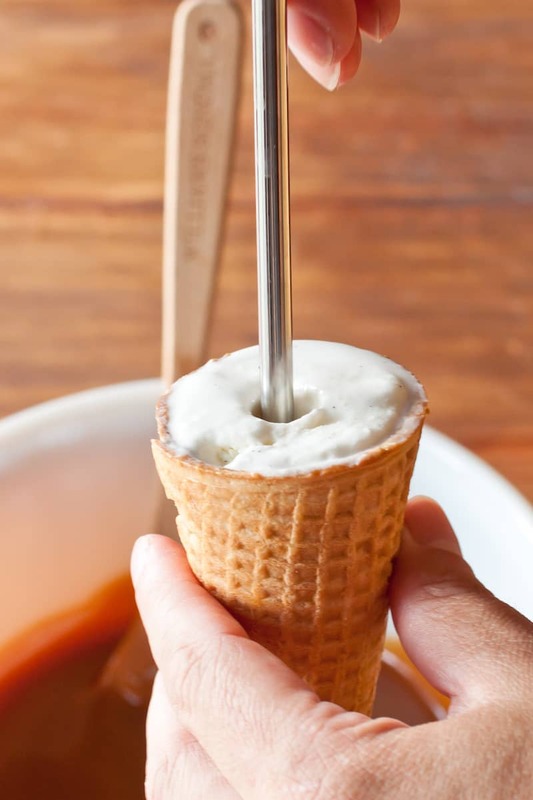 Smooth off the top of the cone and wiggle out a hole 1/2-inch in diameter through the center of the ice cream with a long, poky kitchen tool like a chopstick or a straw (I’m using my stainless steel straw in the photo). You could fill a plastic squeeze bottle with caramel and use it to fill that hole, but honestly? I simply let it drip off the end of my mini silicone spatula and it works like a charm. 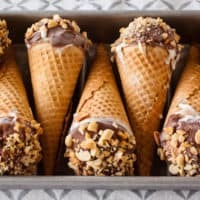 If the ice cream is melting too quickly as you work, freeze everything (the container of ice cream and the filled cones) for at least 30 minutes, then top them off. Scoop rounds of ice cream with a spring-loaded ice cream scoop (a scoop 1 3/4 to 2 inches in diameter works best) and place on each cone. 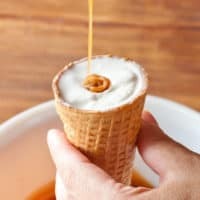 Use the straw and spatula combo to make and fill holes with caramel, just as you did for the cone bottoms. Freeze for at least another 30 minutes. Re-warm the chocolate magic shell over low heat. Working quickly, paint the shell over the ice cream with a silicone spatula, twirling the cone as you paint to make sure the magic shell drips around the edge of the ice cream and coats it completely. Sprinkle the magic shell with peanuts—quickly! before the magic shell starts to harden!—and return the finished Drumstick to the freezer until you’re ready to eat it. Peanut butter caramel is a homemade treat that comes together in minutes and is easier to make than you think. Stir the sugar, water, and corn syrup together in a small, high-sided saucepan over medium heat until the sugar dissolves. Once the sugar dissolves, let the sugar syrup come to a boil without stirring. You can swirl the pan periodically as the sugar cooks, or just let it bubble. As the syrup cooks, it will deepen in color, moving from golden to a deep amber and start to smell distinctly amazing. When the sugar darkens to a rich whiskey color, remove the pan from the heat and immediately pour the cream into the sugar in a thin stream, whisking continuously. Be careful: the liquid will bubble up as the cream hits the molten sugar, so make sure your saucepan is large enough to make sure the caramel won’t boil over. The caramel may seize and harden; if this happens, place the pan back over low heat and keep whisking until the caramel re-melts.